As much as I love Indian food, it is one thing I don’t make from scratch very often. Let’s face it, there are all those special spices you need, lengthy processes involved, and so forth. It is certainly not weeknight cooking. Yet I recently made some chicken tikka masala in under 20 minutes that we enjoyed with a wine pairing in the middle of the week. India in a Box is the company that made such a quick Indian meal at home possible. 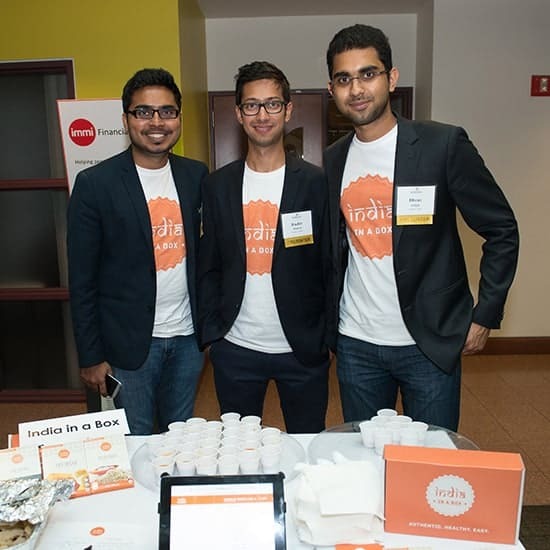 I met the company’s founder, Shyam Devnani, at the popular Mass Innovation Nights Foodie event this summer. India in a Box provides ready to go Indian meals that can be put together at home in 5 minutes or so. They dehydrate the meal, so you basically add water to get a tasty Indian meal ready. The packages are pretty affordable, currently selling at $20 for a box of 4 single serving packages on their company website. So what’s even better than quick Indian food? 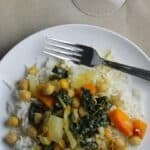 Quick Indian food with a wine pairing! I mention to Shyam that wine pairings for Indian food has been a popular topic here on Cooking Chat, and we both liked the idea of testing out some of the India in a Box meals along with some wine pairings. Today I start by sharing Quick Chicken Tikka Masala with wine pairing. Complimentary samples were provided to me for this quick chicken tikka masala post. As always, all of the opinions expressed are my own. I used the India in a Box Tikka Masala Gravy for this dish. All of their meals come as vegetarian preparations, enabling the customer to add the protein of their choice. I bet this gravy would be good with tofu or chickpeas, but I went with chicken…probably because chicken tikka masala is one of my favorite dishes to order at Indian restaurants, but I’d never made it at home. Now, you could simply add some cooked chicken to the masala gravy, which takes about 5 minutes to prepare. But I thought it would be tastier if I cooked the chicken up with the gravy, adding an extra 10 minutes to the prep time. I was pleased with the results! 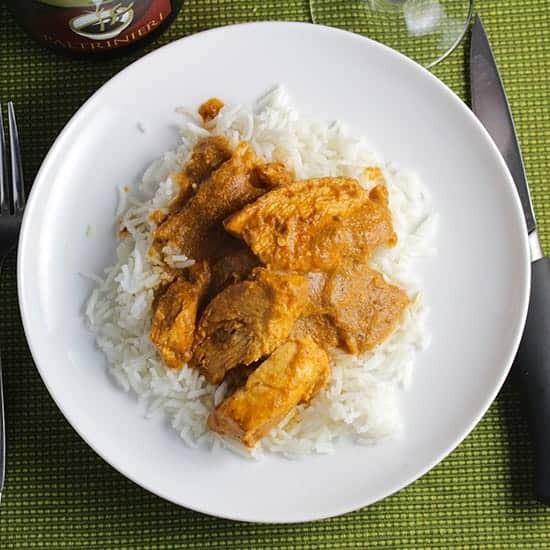 The chicken tikka masala was very flavorful, and made a satisfying meal served over basmati rice. The box describes the masala as a “rich, mildly spiced gravy.” I would say the dish came out comparable to ordering “medium spice” at a typical Indian restaurant in the US. 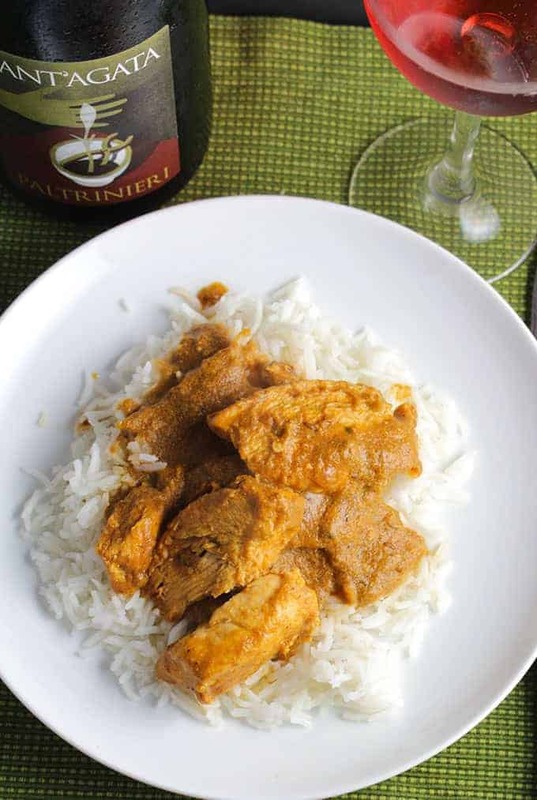 Wine Pairing: Now, about that wine pairing for the chicken tikka masala. The last time I had chicken tikka masala at a restaurant, we enjoyed it with a Riesling–certainly a fine choice for most Indian food. But I like to explore new and interesting pairings here, so I went with a Lambrusco to go with the chicken tikka masala. Lambrusco is a red Italian wine grape from Emilia-Romagna that typically has a bit of light bubbles, frizzante in Italian. Sparkling wine in general can be a good choice for many foods that can be otherwise challenging with wine. 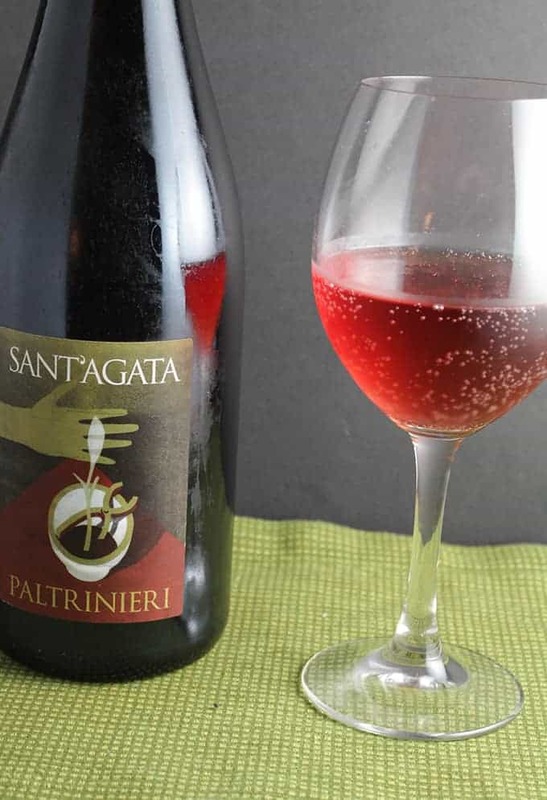 I sampled the Sant’ Agata Paltrinieri Lambrusco at Pairings, and thought it could be an interesting wine to try with the chicken tikka masala. This Lambrusco has a bit of yeastiness on the nose. It’s pretty dry, the dryness and bubbles cleanses the palate nicely, refreshing after a bit of the masala spice. I taste melon in the wine, honeydew perhaps, cooking along with the Indian food. There is a bit of tartness on the finish. Altogether, I would recommend this Lambrusco or other Lambruscos you might find with the chicken tikka masala. You could probably substitute other dry sparkling wines–Prosecco perhaps–if you can’t find a Lambrusco. But the bottle I tried is a good value for under $15. Chicken breast quickly cooks in a masala gravy from India in a Box for an easy, flavorful Indian meal. Heat a pan on medium high with cooking oil spray. Add the chicken breasts, cook for 2 minutes on on side so that it starts to brown slightly. Turn over, cook for another 2 minutes, then remove chicken from pan. Set aside on a plate. When the chicken has cooled a bit, cut it into half-inch thick slices. Empty the contents of the Tikka Masala Gravy mixture into the pan along with the water. Bring the water to a boil, then reduce to simmer. Stir the Masala Gravy frequently as it simmers for 3 to 4 minutes. Add the chicken slices into the gravy, and simmer for about 10 more minutes, stirring often, until the chicken is cooked through. 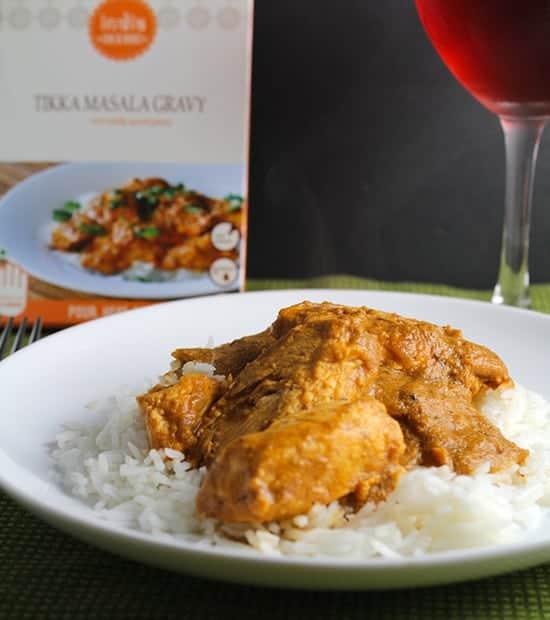 Serve the chicken tikka masala over rice, and with an Italian sparkling wine, if you are so inclined. Like the idea of Italian wine with Indian food? 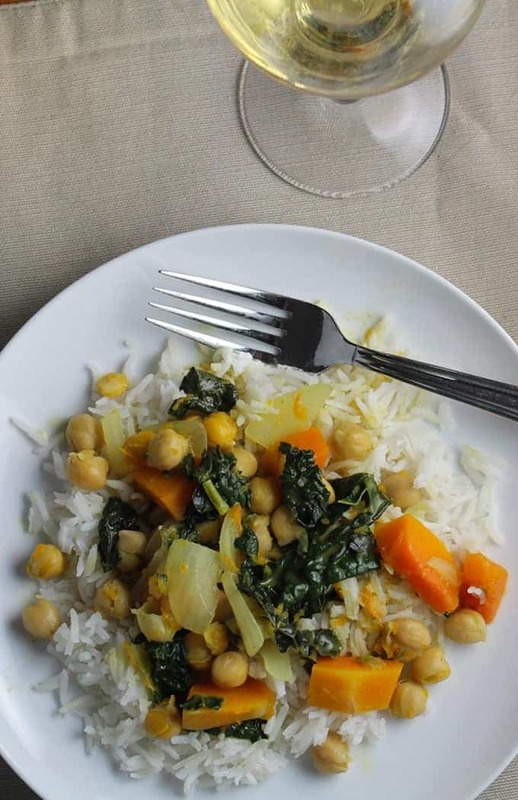 Check out our Kale & Butternut Curry with an Italian wine pairing. This sounds SO good! I love your choice of wine! It all looks and sounds amazing! I am a huge Indian food fan. I used to make it all the time before kids, but they don’t love it the way my husband and I do. However, in a few years we’ll be empty nesters, so I just might be back to cooking it more then! This sounds like a wonderful alternative to get my fix in the meantime! Yes, it is a nice quick option! My ten year old will eat a few things at an Indian restuarant, like the bread and samosas, but hasn’t really warmed up to the curry entrees yet, so this is a nice option.